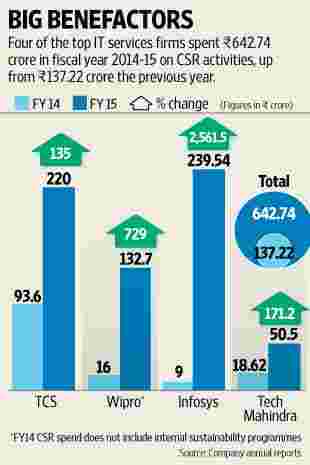 In the first year of compliance with the Companies Act of 2013, IT firms' CSR spending rose from Rs137 crore to over Rs640 crore in FY 15. Bengaluru: When corporate social responsibility (CSR) rules were put in place in 2013, no one doubted that the big companies, at least, would comply with the law. Even so, the effect compliance has had on the information technology (IT) sector in creating social capital turns out to be quite a revelation. Four of the top IT services firms—Tata Consultancy Services Ltd (TCS), Wipro Ltd, Infosys Ltd and Tech Mahindra Ltd—spent ₹ 642.7 crore in fiscal year 2014-15, the first year of implementation. That’s 4.7 times what they spent the previous year on CSR, when the rules hadn’t become mandatory. Still, it emerged as both the biggest spender on CSR activities, and reported the highest increase in CSR spending over the previous year from among the four firms. Most companies carry out their CSR activities through non-profit foundations. Infosys spent ₹ 9 crore on CSR activities in fiscal year 2013-14, and scaled it up 26 times to ₹ 239.5 crore in 2014-15, according to its annual report. It spent most of its budget on education, healthcare and addressing malnutrition, working with nearly 30 non-governmental organizations (NGOs). The company was able to scale up its funding by channelizing its funds mostly to large-scale institutions. For example, Akshaya Patra Foundation, the NGO that feeds schoolchildren, got the highest grant of ₹ 36.8 crore. Institutions like the Indian Institute of Science and Chennai Mathematical Institute also benefited from Infosys’s CSR funds; they received ₹ 21.2 crore and ₹ 33.2 crore, respectively. TCS spent ₹ 220 crore, up from the ₹ 93.6 crore it spent in 2013-14. The company has pledged to spend ₹ 100 crore over the next few years to build toilets for girls in schools under the Swachh Bharat Abhiyaan. As a consequence of the ramp-up in spending, the biggest challenge for most of these companies was in scaling up of the initiatives from the ground up. “It was not just increasing the size of the team, but also the way we thought about programmes," said Loveleen Kacker, chief executive of Tech Mahindra Foundation. The CSR rules, which came into force on 1 April last year under section 135 of the new Companies Act, state that every company with a net worth of ₹ 500 crore or more or revenue of at least ₹ 1,000 crore or a net profit of ₹ 5 crore in a given fiscal year should spend 2% of the profit of the last three years on CSR activities. The activities include efforts to eradicate hunger, poverty and disease, promotion of education, gender equality and women’s empowerment, reduction of child mortality, and contributions to central and state government funds aimed at socio-economic betterment. Preventive healthcare, sanitation, providing safe drinking water, protection of national heritage, rural development projects and measures to benefit Armed Forces’ veterans also count as CSR activities. Given that Tech Mahindra’s CSR budget grew from ₹ 18.6 crore to ₹ 50.5 crore, the foundation had to add at least 30 new implementation partners in the last fiscal year to carry out programmes in education and employability. Not just that, the funding amount to NGOs also increased from an average size of ₹ 25 lakh to ₹ 1.5 crore. “When the kitty was small, we chose smaller programmes and partners. But now with the budget increase, we wanted to add bigger and fewer implementation partners. Else the number of partners would be unmanageable," said Kacker. Yet, another challenge for the companies is to find NGOs that have the capacity to be able to accept the funds from corporate entities all of a sudden, said Anil Misquith, operating partner at Samhita Social Ventures, a CSR consultancy. Misquith expects many companies to fall short of the 2% target in FY15 because being the first year of implementation, companies would have had to put many things in place, right from identifying causes to finding the right partners. Even though Infosys was the highest spender, it did not completely meet the 2% target and was shy of it by around ₹ 3 crore. TCS, too, saw as much as ₹ 66 crore going unspent this fiscal year and met 1.5% of the requirement. Infosys said in its annual report that the unspent amount of ₹ 3.46 crore was pending due to documentation and was spent in April 2015. TCS said the amount was unspent because its toilet-building project for girl students in schools across the country is a multi-year project. It is not a violation to not fulfil the 2% requirement as long as the company discloses why it did not meet the requirement. Among the four that allocated more funds than mandated, Wipro spent ₹ 132.7 crore, about ₹ 4 crore extra. And Tech Mahindra spent about ₹ 20 crore more, according to its annual report. Most companies spent on education, skill development and healthcare during the year. “There is a lot of scope for innovation and trying new things. But most companies are going through a learning curve and are spending on models they know will work," said Misquith. TCS, Infosys and Wipro did not respond to emailed questions sent to the companies.